What is the nature of transformation? Is it sudden or incremental, a battle or a consummation? 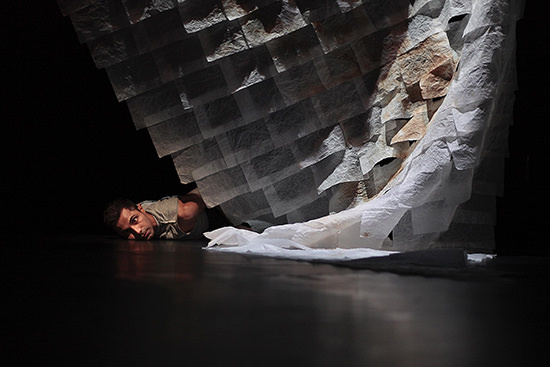 These questions about shape-shifting, both physical and cultural, lie at the heart of Raghav Handa’s highly anticipated new work, Mens rea: The Shifter’s Intent at the Judith Wright Centre. Handa’s sinuous grace is on display from the first moment of his explosive choreography: a remarkable combination of athleticism and fluidity, where his body rolls, ripples and flows, a river of movement that is only stilled by the full extension of his expressive hands. The detail marked by the angle and rotation of those hands was one of the true pleasures of the three disparate choreographic vocabularies developed within the show. In some sequences Handa evokes the whisper of animal or ritual, perhaps echoing the vocabulary of the contemporary Aboriginal choreographers whose works he has danced across the last 10 years. In other parts, there are hints of the seemingly arrhythmic Kathak dance form or the voluptuous invitation of Sita, one of the three characters from the Sanskrit epic The Ramayana from which the show draws its loose narrative. The design echoes this sense of separate worlds by demarcating zones that showcase the contrasting choreographic vocabularies and the individual ‘characters’ that Handa inhabits. Dominating the stage is a large, rectangular screen. On one side of the screen is a waterfall of white material in a honeycomb pattern that drapes gently and asymmetrically like a willow tree, shivering at Handa’s touch as he crawls underneath, through and then climactically behind, to form a shadow in silhouette. Periodically a long, rectangular spotlight cleaves the stage in two. Handa dances along and within this light, only occasionally darting across. Even when not visible that emphatic division haunts the stage. Darren Blinkhorn’s soundscape is pulsing, thrumming, bass-braced electronica with percussive elements that move irregularly within the soundscape, lightly evoking both traditional Indian instruments and Indigenous motifs. Handa moves like a dream and there is much to savour in each of the sections of the unfolding work. However, the very characteristic that makes the choreography so pleasurable—its fluidity and dreamlike atmosphere—is lost in the transitions between each zone. Most of these occur in black-out and this sometimes adds a sense of intrigue—where will he emerge now? But at times if feels clunky, pulling you from your reverie as you glimpse a hurried figure in the dark moving across the stage. This seems the big dramaturgical dilemma for Mens rea: The Shifter’s Intent. How do we shift from one state or atmosphere to another? How do we hold one culture when we are working within the shape of another? Perhaps the full liminality of the work would be to light and showcase these transitions, to slow them down and explore opportunities for slippage or confusion? This work’s rectilinear quality was further emphasised by the dominance of the screen as the vehicle for the 3D animation built by Deakin Motion Lab with Handa as one of the mythical shape-shifters, Ravana. A long sequence in the final part of the show portrays the climactic battle where Jatayu, who rescues Sita, is devoured by Ravana. Handa duels with his own animation and we are cued to put on our 3D glasses to receive the full impact of this arresting animated creature when a small wheel of fire appears at the bottom of the screen. 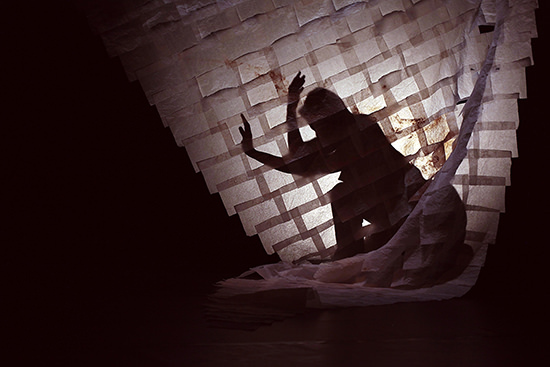 While the skill of both performer and animators is evident, there is none of the trans-media wow factor of Deakin’s more large-scale work like The Crack-Up (2015) where a digital landscape is projected around dancers suspended in the air, or the intricate traditional scenography of their collaboration with Opera Victoria on the Flying Dutchman (2015). I found the intractability of the screen at the back of the stage hard to reconcile, despite the quality of both the digital and live content. 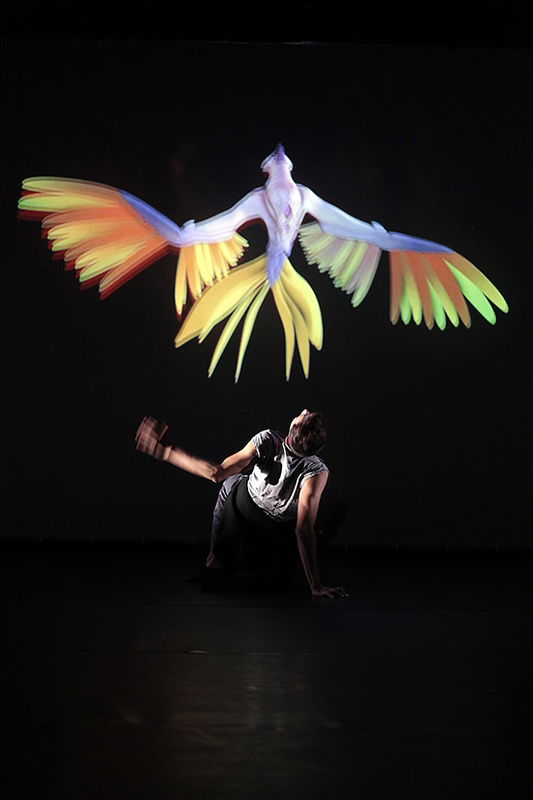 Raghav Handa’s bravery in trialling this new technology is to be commended and his talent as performer and choreographer is evident throughout the work. As Mens rea heads to the UK I am sure that delineations will soften and new discoveries will arise about the space between the shifting body and the atmospheres of this compelling new dance work.